Home/People and Sound/National Defense/How is sound used to monitor nuclear testing? Locations of CTBT hydroacoustic stations. Credit: Natural Resources Canada. The Comprehensive Nuclear-Test-Ban Treaty (CTBT) bans all nuclear explosions on Earth whether for military or for peaceful purposes. The CTBT includes an extensive International Monitoring System (IMS) to verify compliance with the treaty. The IMS is a network of over 300 monitoring stations, each using one or more of four different techniques designed to detect any nuclear weapons test: seismic stations, infrasonic stations, radionuclide stations, and hydroacoustic stations. 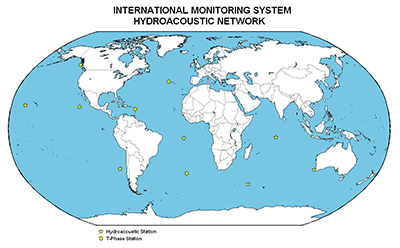 The 11 hydroacoustic stations are distributed around the oceans and are of two different types: six underwater hydrophone stations and five seismic stations on islands. 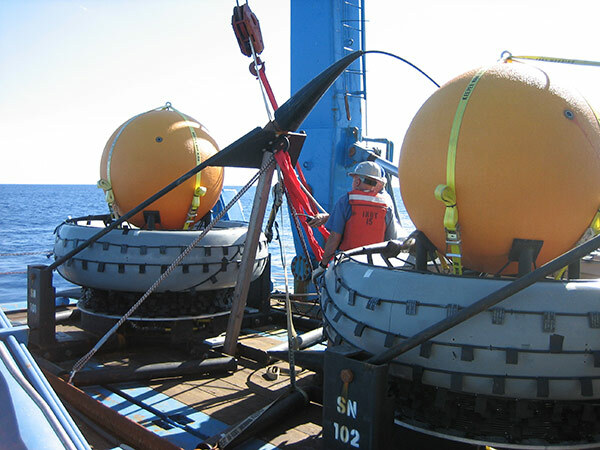 The CTBT hydroacoustic monitoring system is designed to detect nuclear tests conducted underwater and at atolls, such as those done throughout the 1940s and 1950s. A nuclear device detonated underwater or very near to the sea surface generates a sound wave with a unique signature. Only a few monitoring stations are required underwater because the sound wave from a nuclear weapon test can be detected at great distances in the ocean. Layout of a CTBT hydroacoustic station. Diagram by the Preparatory Commission for the Comprehensive Nuclear-Test-Ban Treaty Organization, www.ctbto.org. The underwater hydroacoustic stations have three hydrophones positioned in a triangle approximately 2,000 m on a side and located in the SOFAR channel. 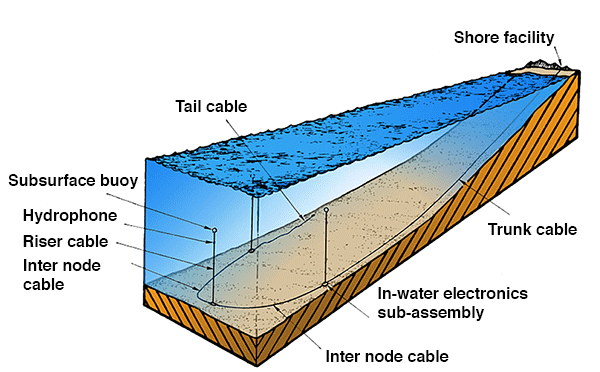 The hydrophones are suspended on a riser cable with a subsurface buoy and connected to a trunk cable that carries the signals to a land-based station. There are also five hydroacoustic stations that use seismometers placed near the shoreline on oceanic islands. When a sound wave from a nuclear weapons test encounters a sharply sloping sea floor, the sound wave converts to a seismic wave that travels through the ground. Hydroacoustic stations can also detect earthquakes and tsunamis. For example, all of the operating hydroacoustic stations detected the 9.0 magnitude earthquake located off Japan in in March of 2011 and the hydroacoustic station at Wake Island (located in the western North Pacific) detected the resulting tsunami. Two buoy and riser assemblies of a hydrophone station sit on deck, ready to be deployed. Once the assembly is placed on the seafloor, the subsurface buoy (orange) is released, lifting the riser cable and placing the hydrophone into the sound channel. Copyright CTBTO Preparatory Commission. Preparatory Commission for the Comprehensive Nuclear-Test-Ban Treaty Organization.